The Dutch composer, music journalist and novelist Elmer Schönberger once described the Second Symphony as a sub-genre – of a primarily psychological nature, albeit with considerable stylistic consequences: in a first symphony, a composer will more or less reflect the traditions from which he comes, and in a second he will deliberately break away from them. 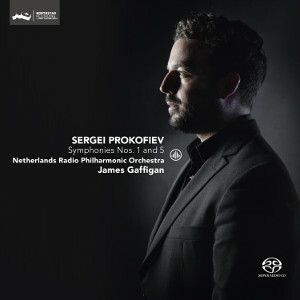 Prokofiev’s Second, composed eight years after the First, appears to be a defiant ode to the modern era, witnessed by the layers of mechanically persistent rhythms, expressionist harmonies, ostensibly unfathomable forms and its very expansive take on tonality. The work was premiered in Paris in 1925, conducted by Serge Koussevitsky. Prokofiev decided to revise his Fourth Symphony, Op. 47, after the successful premieres of his Fifth and Sixth Symphonies (in January 1945 and December 1947 respectively). The original four movements remained largely intact, but the changes say a great deal about his style at that point. The first alteration was to insert or expand some passages that were predominantly reflective, with a strong emphasis on melody. Another example is the attempt to align the scale more closely with what was required by Social Realism, in which the neo-classical is overlaid with a considerable dose of heroism and sometimes even bombast. The association of Op. 112 with Social Realism subsequently proved to be an obstacle to its acceptance in the West. It’s done. It took some time; the first recording in this cycle (number 7) dates from 2012, and the final one (number 2) from 2016. One wonders why Challenge Classics kept things for so long under wraps. There is absolutely nothing to be shy about. On the contrary. Looking back one might say that we have here a cycle that breaks many barriers. Who would, at the outset, have thought that James Gaffigan was the right choice for this unique enterprise? 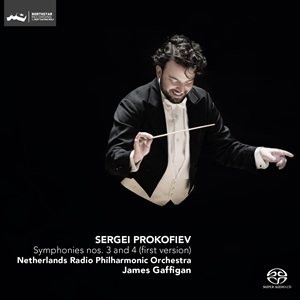 Wouldn’t a Russian conductor have been in a better position to capture the essence of Prokofiev’s symphonic output? One might ask: How Russian was Prokofiev’s music anyway? Ukrainian born and a regular visitor to the Western World, he choose to exile himself for 18 years, starting in Japan (coming from Vladivostok), on to San Francisco, New York, then London, Paris …the usual; marrying a Franco-Polonaise of Spanish origin. Symphonies 2, 3 and 4 were composed during this period. The beauty of this final volume is that it gives in a nutshell an overview of Prokofiev’s compositional life. Setting apart the first, classical symphony, the second is typical for a young composer carving out a place under the sun; to distinguish himself from the rest, most notably from someone with a similar, Russian background, Igor Stravinsky, who was able to attract so much attention; good or bad. The 1925 premiere of the second in Paris was a disaster. And the tragic was that no one talked about it ever after. A third symphony followed. Premiered in Paris in 1929. No great success either. Disappointed? Possibly. The liner notes say that he bought a home in Moscow in 1933 and returned to his homeland to settle there in 1936. This in essence being correct, there is a different tale, too: Lured to the homeland by the Soviet régime with the promise of an apartment in Moscow, a car and a Dacha. A reward for being the Russian musical Ambassador to Paris? In his baggage was the score of the fourth symphony, which, in his initial form, was sidelined to rehearsals in a smaller hall in Brussels as The Great Igor occupied the main hall rehearsing his Symphonie of Psalms. The symphony was seen as ‘not very original’ and too ‘conformist’. Once back in Russia he stayed away from politics, devoted much time to composing, having to abide by official ‘guidelines’. His fifth symphony was a big success and found him recognition as one of the great composers of Russia (until he, too, fell from grace). Had he become a musical servant to his masters? The revised version of his fourth symphony, as played on this final volume, only 6 years before his death, suggest so much. It adds a layer of heroism of the Soviet People. I’ve been dwelling on these elements as they have, in my view, a bearing on the way Prokofiev’s symphonic oeuvre should be interpreted. Some critics believe that Gaffigan is too soft. I see it differently. Prokofiev is no Shostakovich. It is said, and so do I, that many master pieces have been written under duress. It goes maybe too far to say that an artist must always suffer, but oppression can bring out the best. On the other hand, it is also true that a great artist can conform to superior demands and still be exceptional. 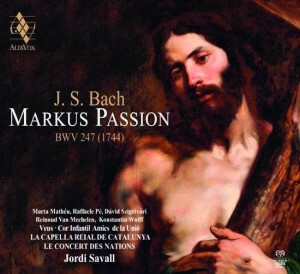 Bach is a shining example. 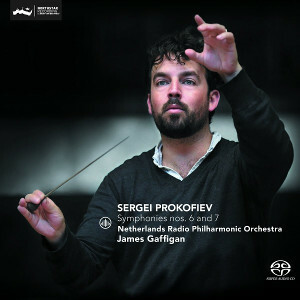 In a previous review I said: “that I was much impressed by the way this young American conductor was able to lend these symphonies such a surprising degree of musical value” and that “this second volume does not only confirm my first impression, it reinforces my believe that James Gaffigan is one of the more prominent young conductors of our time. “ It all holds true for the final volume. The would be ‘avant-garde’ style of the second symphony is projected by Gaffigan in a way making the listener aware of the kind of intellectual eagerness from a young composer obsessed by the mechanics of industrial growth and possibly foreshadowing large scale war preparations, utterly misunderstood in the new musical world, ticking all the wrong boxes. 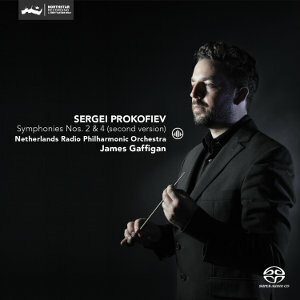 Gaffigan, with the support of an excellent Netherlands Radio Symphony Orchestra ‘undresses’ the symphony, laying clinically and forcefully bare its intrinsic ‘neither-nor’ attempts to become a composer of note, especially in the assorted mixture of theme and variations, following the unsettling first movement. All in sharp contrast to Gaffigan’s masterly account of the heroic polish and subtle lyrical schmaltz of the fourth in its second reading. Not only is Gaffigan a gifted conductor, he demonstrates a special feeling for Prokofiev, putting the symphonies in a realistic, time-less new light, giving the music the emotional power it merits, shunning unnecessary melodramatic accents, never becoming grotesque, while lifting out all the universal lyrical beauty they encompass and, most of all, the natural and true to type manner they deserve to be heard. The sound quality is beyond reproach, bringing out detail and pure definition. Taking sound, sense and soul together, and without denying virtues and accolades to others, this set is, now completed, for me the one to have. Gaffigan&apos;s survey has been consistently excellent and it is encouraging to read from Adrian&apos;s review that his previous high standards have been maintained. The Second Symphony is unquestionably challenging for listeners and understandably has never been a popular concert hall work for programmers. Time has not helped and at best one might consider this purchase as necessary only for completeness. The revised Fourth will be seen by some as being slightly more palatable than the original version. Gaffigan is not first choice although maybe on SACD but both Neemi Jaarvi&apos;s 1980&apos;s survey with the RSNO and the recent Karabits survey on RBCD with the BSO have set the bar and will be hard to beat. Both Prokofiev and Karabits emanate from Kiev, Ukraine which may have some bearing on interpretation of this man&apos;s music..
Would that be better than the SACD DSD physical format, which most of us prefer (while it lasts)? Unfortunately only available in stereo, taking away much of the thrill of a three dimensional room filling sound experience. This is the hoary old chestnut first raised by Teresa (DSD) on SA-CD.net some years ago - if you happen by these backwaters even today, "Hi! and Hope you are well". Should the perceived SQ of a recording be considered as part of the overall assessment of the musical performance. Undoubtedly the experience of a listener must be affected by the SQ of a recording, the recording process is after all not transparent and poor practice can easily mask detail or place wrong emphasise on phrasing, expression or emphasis. If it is the aim of the recording engineer to reproduce in the home a near facsimile of what he or she heard in the concert hall during recording then it can be argued that the role of the recording engineer is almost as important as those of the conductor and musicians. Transparency must be the aim but technology isn&apos;t there yet. As to Physical v Virtual playback, it must be a question of the quality of the equipment being used to retrieve the data. I know of no serious listeners using state-of-the-art data retrieval in both forms who has claimed an SQ advantage for the Virtual form. There is no question of the merits of Bert van de Wolfe recordings, certainly up there with the very best of the SACD recording fraternity and in many ways less stylistic than some, it is the absence of a "house-sound" that makes them so attractive to many. I am a music lover and audiophile and my dac can play up to dsd 256 and dxd. Although I did not compare any of Bert’s Prokofiev sacd’s to the dxd/dsd 256 version, I made such comparisons in the past when I still owned the DCS four stack Scarlatti (sacd) player. In a a high quality / high end audio set up the dxd/dsd 256 files sound to my ears superior to the sacd’s. Have not been able to play with for eg the DCS Vivaldi four stack or MSB select dac in my own audio system, some of the latest and ultra expensive high end players. Maybe sacd’s sound on these devices ‘heavenly’ as well. And oh, top notch stereo high end can in my view sound as ‘thrilling’ as multi channel but I suppose we can disagree on this. I am very firmly and probably financially in the Stereo camp and totally agree with you about stereo, a medium that is very much under-valued by many mch fans. As always &apos;though one must compare like with like and few are able to boast mch systems costing $200k. R. de Vries said: “top notch stereo high end can in my view sound as ‘thrilling’ as multi channel but I suppose we can disagree on this”. I do, and wholeheartedly so. But one needs space to profit from it. In a smaller room I would do as John (and you): buy the best stereo you can afford. As to the other question: I can play downloaded DSD files (without DSD PCM conversion until the final conversion in the power amp) and although my equipment is not the highest end money can buy, I can assure everyone that there is no audible difference between these files and the physical product (as far as Challenge Classics and other top manufacturers are concerned). Lastly: the sound engineer is as important as the conductor and musicians and top labels make sure they work together for the best end result. I mentioned earlier that I am looking askance at the room I have left for storing discs. I am building library shelves along one wall of my listening room. That wall does include a full sized "Murphy Bed" in its slightly more than 7 Meter length. But there is a good length of wall space remaining. Still I am concerned about physical storage for all of my discs. Downloadable files is in my future, especially with the Oppo BDP 205 available. One of my friends has, however, been suggesting that I may prefer the sound of the exaSound E-38. My son, also an EE thinks the Oppo should be superior, because it has a more recent version of the ultra high end ESS "Sabre" DAC. Regardless, I will be investing in high resolution downloadable MCH files very soon and I have my eye on DSD downloads. Channel Classics has up to 4 times DSD on offer for some of their titles. My friend Tailspn whom some may remember from SA-CD days expressed his belief that Downloadable files, especially the higher sampling rate ones sound better in the sense that they do even better that which DSD 64fs does well. Anther point I want to make is that a notable neuro-scientist recently retired from New York University, doesn&apos;t think you can replicate 3 dimensional reality with 2 channel stereo. The fault (over simplifying here) is that sound coming from behind you during a concert must come from in front of you when reproduced in 2 channel stereo. Finally, depending on a number of factors, what you have when you set it all up at home, may not bear much of a relationship to the amount of money you spent, if your priority is to replicate in your home, that sound you hear in concert. And yes that by golly is what everyone I know with an interest in this really seeks to do. Phooey on sound effects. That is why the only 2L discs I own are of piano music and piano and violin music. You can&apos;t do too much to spoil that broth! Bruce, don&apos;t feel sorry. I was just trying to do my best. Most people are right in their own world and we had some nasty discussions in the past (the old SACD net). Love your comments, though. I&apos;m, like you, an oppo and confirmed m-c man, but others may think differently. Whatever the case, it&apos;s the people like you (and ex-fox John) keeping this site on edge and hence alive! In my (high end) system I can hear very clearly the differences between various files formats. For example I used to buy the Channel Classics recordings in both the dsd 64 and (pcm) 24/192 format. 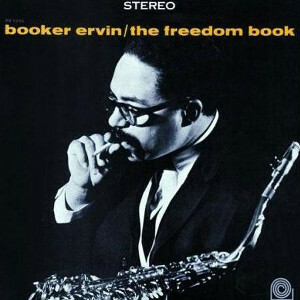 Typically I prefer the original recording format (so dsd 64 for CC). However, the differences between Bert’s recordings in dxd (his original recording format) and dsd 256 are small in my view. In my set up the former sounds somewhat more open, the latter a little bit more lively from a tonality point of view. In both formats Bert’s Challenge Classics recordings sound very impressive indeed. And it is (indeed) possible to create a wide and deep soundstage as well as a 3d presentation (within this soundstage) with a stereo set up. To my ears multichannel (the various set ups I heard so far anyway) sounds somewhat artificial. We all say something like "my goal is to reproduce as nearly as possible what I experience in the concert hall". But what is that? After long experience in halls both good and bad I prefer to sit 15 or so rows back on the main floor or in the front of the first balcony. But I know people who think the first couple of rows are great or perhaps even the "conductor&apos;s circle" because they want to see the concert as much as hear it. Surely we don&apos;t all hear/experience the same thing, at least sonically. And I don&apos;t think stereo and multichannel listeners have the same priorities (I&apos;ve been both). My observation, for what it&apos;s worth, is that stereo listeners prioritize detail, positionality, imaging, call it what you will, while multichannel listeners prioritize scale (which shouldn&apos;t be confused with loudness) and a sense of space. Each can be catered for within reasonable budgetary contraints but probably not both together without spending many kilobucks on equipment and having the benefit of a large listening room. As it happens I&apos;m in the middle of transitioning back to stereo because of a health related move to smaller quarters in a "life care" community, effectively cutting my listening room size in half. As a result I&apos;ve pulled some old Musical Fidelity class A amplification out of the closet, invested in the Oppo 205 hooked up through the analog outputs and some better stands and cabling for the "bookshelf" speakers that the room will accommodate and you know what, it ain&apos;t half bad. One cavil, if I may. John that "Star Wars" thing is a straw man. I&apos;ve listened almost exclusively in multichannel for twelve years and have something over 1100 sacds in my library. Of those perhaps 20 have the type of sound you describe and most of them are Tacet or 2L recordings of small groups where I knew what I was buying. Some of the reissues from Dutton/Vocalion have the bad old days ping pong quad mixes intact, but they stay firmly anchored to the shelf. Rudolf de Vries said: “To my ears multichannel (the various set ups I heard so far anyway) sounds somewhat artificial”. Then listen, if you can, to Challenge Classics in multi-channel. You’d be surprised. Of course, all depends on the engineering. And Bert van der Wolf and his crew are very good at that. But please, let&apos;s not forget the music. I totally agree with you, Adrian, that we should not forget about the music. However, being an audiophile (using inter alia single ended triode amplification) the sound quality of the music I am listening to at home matters (greatly) to me. And you know what, Prokofiev has never been one of my ‘favourite’ composers. 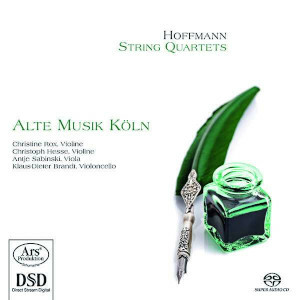 I used to listen much more to symphonic music from composers like Debussy, Ravel, Shostakovitch, Bartok, Bruckner and Mahler. But Bert’s beautiful sounding (Prokofiev) recordings made me listen quite regularly to his / the Prokofiev symphonies lately and as consequence I have started to appreciate Prokofiev’s (symphonic) music much more than ever before. And that includes the somewhat ‘strange’ but fascinating second symphony. By the way, my fascination for this second symphony was (firstly) triggered when Bert allowed me to join one of the recording sessions at the MCO in Hilversum. A real joy to watch professionals like the conductor Gaffigan, the orchestra and the recording team record this symphony. Bruce, our family collects everything! My wife can read three or four times faster than me so between us we have amassed a substantial library of literature during our lifetimes on just about any topic under the Sun. On top of that we still house the collections of our sons who despite now being richer by far than us, married and comfortably living elsewhere in not inconsiderable accommodation that they own still use our abode as convenient long term storage reference libraries. Many times we have confronted the dreaded de-cluttering fashion only to shy away from any thought of disposing of a single book. Books have been and remain part and parcel of our lives and who we are despite the internet and Apple, Google, Wiki & Amazon and instant access to the World&apos;s information. Why would you or should you see vinyl records, CDs or SACD&apos;s in any other light? Quick decisions are nearly always regretted. Build the Shelves as one president might say! with regard to Oppo 205 I found via analogue it was unlistenable and sold it off at a loss,the late Charles Hansen on Audio Asylum described it as a piece of junk and I agree. IMO most if not all reviews of Oppo 205 are inaccurate. kal Rubinson in his Stere0phile review said for long term listening he preferred using the 205 with a DAC that costs several times more than the 205, I could not listen to it for short term. I see that Hired Fox & others just do not understand mch SACD, when properly set with a good recording it is more realistic than Stereo and gives a better Concert Hall experience. Well, that nice congenial comment made my day! I suppose if "most if not all" of the reviews are "inaccurate" that&apos;s because they disagree with your assertion and find the product good value for money (not all of us can afford a DAC that costs "several times" the price of the 205). PS. Long term experience with Audio Asylum convinced me it is aptly named, a hangout for obsessives, narcissists, and people who need others to tell them what to think. I just want to say that this thread reminds me of the good old days. Theresa (DSD) and Tom (Tailspn) mentioned in the same thread! The worst and the best! I think I miss them both, and I miss SACD.net! Kal Rubinson Stereophile reviewer frequently posts in Audio Asylum , so you think he fits your decription. william Hecht you have totally misunderstood my post on the 205, this piece of junk should not be purchased, no need to buy an expensive DAC.If you want an excellent mch SACd or CD player buy the Sony X1000ES it contains a 32 bit dac that the reviews fail to mention. I now see that Oppo are no longer going to produce audio products. 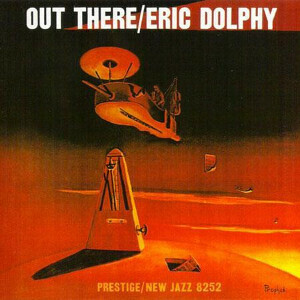 Let&apos;s see now, in his Sterophile column Music in the Round #87 Kal Rubinson says of the Oppo UDP-205 "I loved the UDP-205&apos;s sound through it&apos;s analog outputs....the sound I got from the UDP-205 was honest, revealing the quality of the recording and the performance...." Sure sounds like he didn&apos;t like it. By the way he seems to be a very nice guy and we had some pleasurable exchanges back when he participated on the old site.